1. The territory of the Republic of Somaliland covers the same area as that of the former Somaliland Protectorate and is located between Latitude 8’ to 11’ 30’ north of the equator and Longitude 42’ 45 to 49’ East; and consists of the land, islands, and territorial water above and below the surface, the airspace and the continental shelf. 2. The Republic of Somaliland is bordered by the Gulf of Aden to the north; Somalia to the east; the Federal Republic of Ethiopia to the south and the west; and the Republic of Djibouti to the north west. This map of the Somaliland Protectorate and consequently of the independent STATE OF SOMALILAND, and. since 1991, the REPUBLIC OF SOMALILAND sets out clearly the international boundaries which were delineated under a series of international agreements. Briefly, the international boundary between Somaliland and Ethiopia was based on the 1887 agreement between Britain & reached Ethiopia. The Treaty consisted of a formal convention of six Articles and annexures containing, among other things, an exchange of notes, which, according to Article 2 of the Treaty shall determine the frontiers of the “British Protectorate on the Somali Coast”. The exchange of notes took place during the same year and the final letters were annexed to the treaty by 8 December 1887. A boundary demarcation commission met in January 1932, and started the work on the ground setting up boundary lines, roads and bollards. We shall be looking at separately the controversial aspects of the 1887 Treaty, as well as the 1954 Agreement which re-affirmed the 1887 Treaty in respect of the “Haud and Reserved areas” grazing rights, but on its independence on 26 June 1960, the new Constitution of the independent STATE OF SOMALILAND defined the territory of Somaliland as “all that territory which, on the commencement of the Constitution, is comprised in Her Britannic Majesty’s Protectorate of Somaliland” (s. 2(1)). The Somaliland - Ethiopia boundary, runs for 463 miles from at the 8 N. 48 E. (the tripoint of Somaliland-Eithopia-Somalia) to Madaha Jalelo at the tripoint of Somaliland-Eithopia-Djibouti boundaries. The demarcation of the boundray and its marking with bollards was undertaken in the early 1930s. The boundary between the Somaliland and Djibouti was finalised in an agreement between Britain and France signed in February 1888 and the actual demarcation of the trijunction point of the British/French Somaliland and Ethiopia was delineated by the 1936 British Somaliland-Eithopia Boundary Commission. (For a brief account of this boundary see the IBIS Boundary Study). Finally, the boundary between Somaliland and Somalia was defined in the Anglo-Italian Protocol of May 1894. This boundary, which was demarcated by an Anglo-Italian commission in 1929 runs very simply along the 49th longitude (49E), from the Gulf of Aden to latitude 9 degrees north, and then diagonally across to the intersection of the 48th longitude (48E) and latitude 8 N. The Somaliland boundary then runs west along the latitude 8 N which is the start of the boundary between Somaliland and Ethiopia. (See here map of the State of Somaliland’s boundary with Somalia on its independence on 26 June 1960 and before its union with Somalia on 1 July 1960). Shortly after the 1894 agreement, it was was settled that although the village of Bandar Zaida (on the coast) fell to the west of the 49th meridian, it will remain in the (Italian) Somalia and so on near the coast the boundary moves to the west of the meridian for a few miles. On union with Somalia on 1 July 1960 this boundary ceased to be an international boundary but it continued to remain as internal border between the Northern Regions (as Somaliland became) and the Southern Regions of the new Somali Republic Republic. 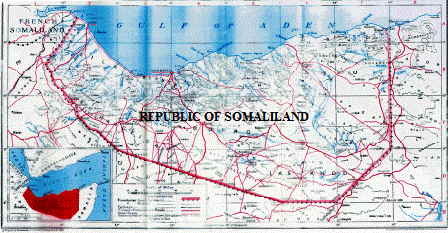 Despite some tinkering in the 1970s, specially around Garowe and the newly formed Nugal Region of Somalia, the former international boundary remained remained substantially intact as an internal regional border (with Sanag and Sool region on one side and Bari and Nugal region on the other) until 1991 when Somaliland re-asserted its independence. Despite Somaliland’s lack of international recognition so far, the importance of the continued use of the international Somaliland/Somalia border as an internal administrative border during the period of the existence of the union is that it has become the practice of unions of countries that dissolve, for whatever reasons, to use either former international boundaries or even internal administrative borders as the boundaries of the new emerging states. This is an extension of the doctrine of uti possidetis, the application of which predated the Cairo OAU Declaration of 1964 and was likened to a “photograph” at a specific moment, i.e at independence. For Somaliland, independence was on 26 June 1960 and not on 1 July 1960 when it entered into a voluntary union with Somalia and the fact that the OAU Declaration was made in 1963 does not affect the application of the doctrine. On the latter date, it was only the international boundary that (Italian) Somalia had with Kenya and the “administrative” (as it was never delineated) international boundary that it had with Ethiopia that became the international boundaries of the new united Somali Republic state. The other boundaries of the united country in Somaliland (i.e with the then French Somaliland and with Ethiopia) were already the international boundaries of the independent State of Somaliland. Arguments advanced by some “union for ever Somalis” to the effect that the Cairo Declaration of 1964 related to the boundaries of the then Somali Republic overlook the fact that a) the Declaration itself refers to borders on independence, which as far as the Somali Republic was concerned was not just 1 July 1960, but also 26 June 1960 when Somaliland became independent and b) in any case, the Declaration was simply reflecting the doctrine of uti possidetis, with, as mentioned above, the “photograph is taken” at independence and not at 1964 when the OAU formally endorsed the concept. Somaliland is of course addressing peacefully the issues relating to neighbouring clan based Puntland region of Somalia and its claim on swathes of Somaliland territory on the basis of clan kinship with Some of the Somaliland communities in the eastern regions of Sool and Sanag. The salient point though is that all the other Somaliland clans also live in areas that straddle the boundaries that Somaliland has with either Ethiopia or with Djibouti, and similarly member of the same sub clan Puntland bases its claim on also live in the far south of Somalia, as well as across the boundary in Northern Kenya.